Home / My Practice / George B. Holmes Jr., M.D. 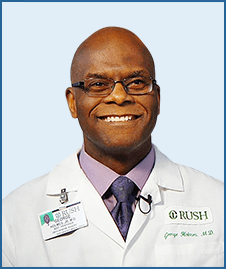 Dr. George B. Holmes, Jr. has been the Director of the Orthopaedic Foot and Ankle Section at Rush since 1992. He has also been on the Editorial Board of Foot and Ankle International since 1989 and has spoken before numerous local, national and international audiences. Originally from Washington, D.C., where he graduated from St. John's College High School, Dr. Holmes received his Bachelor's degree from Yale College in New Haven, Connecticut. He also lettered in varsity football during his tenure at Yale. He went on to complete his medical degree from the Yale University School of Medicine. Following his orthopaedic residency at the Harvard Combined Orthopaedic Residency he completed a Sports Medicine Fellowship at Boston's Children's Hospital Medical Center and a fellowship in Foot and Ankle Surgery in Oakland, California, under the direction of Roger Mann, M.D.Following his orthopaedic residency at the Harvard Combined Orthopaedic Residency he completed a Sports Medicine Fellowship at Boston's Children's Hospital Medical Center and a fellowship in Foot and Ankle Surgery in Oakland, California, under the direction of Roger Mann, M.D. 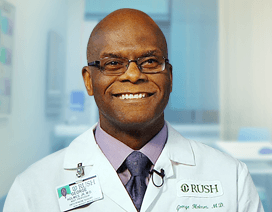 Prior to joining the orthopaedic service at Rush in 1992, Dr. Holmes served as the Director of Foot and Ankle at the University of California at Davis and Chief of Orthopaedics at Jefferson Park Hospital in Philadelphia. He has been a medical consultant to the N.B.A. Sacramento Kings, the Joffrey Ballet, the Alvin Ailey Dancers, Philadanco, the Boston Ballet, the Boston Marathon and Mrs. T's Triathlon. Dr. Holmes Has been a team physician for the Chicago Bulls since 2004. 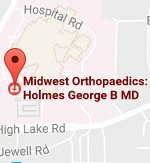 Click here for more information of George B. Holmes Jr., M.D.